Flexible Thermistors are NTC thermistors which have flexible insulation to help simplify product assembly or provide unique monitoring solutions. Using flexible thermistors will help to speed up assembly and thus minimise production handling costs. Their small size give fast, accurate sensing and/or temperature control in numerous domestic and commercial applications. These basic thermistors can also be customised to meet exacting requirements and supplied with connectors or various housings. Widely used in commercial refrigeration, e-vehicle batteries and home automation products, Semitec flexible thermistors provide the ultimate temperature sensor solution. 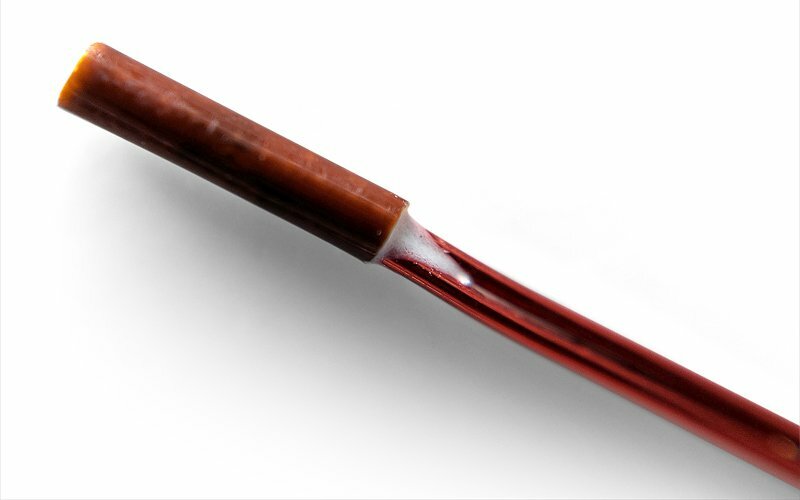 Semitec AT-4 thermistors have flexible, PVC insulated lead-wires and so they offer all the technical benefits of the AT-2 ntc thermistor and also help to simplify the battery assembly process. Call us to discuss any specific requirements. 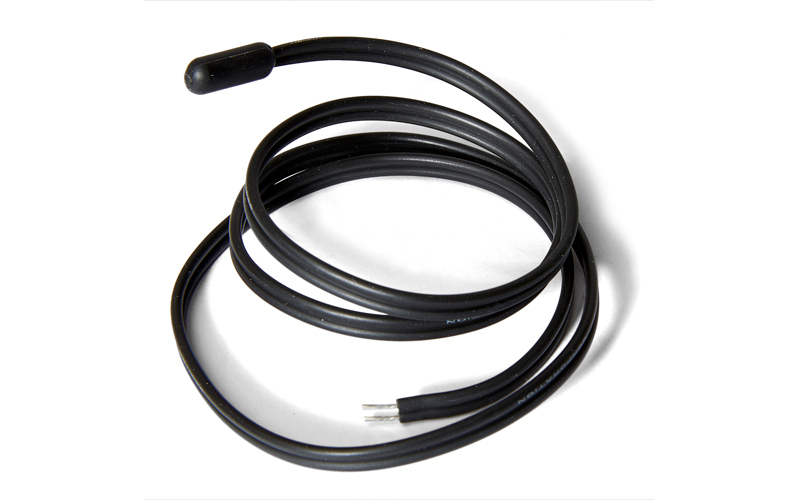 Semitec AT-11 thermistor sensors are TPE encapsulated sensors suitable for temperatures from -50°C/+110°C, and offers excellent and accurate low-cost solution for general temperature sensing applications. Available from stock is the standard 600mm long 103AT-11, as well as 1.5m and 3m long versions. Semitec’s JT series of thermistors are ultra-thin flexible film NTCs that give a very fast response to temperature change. 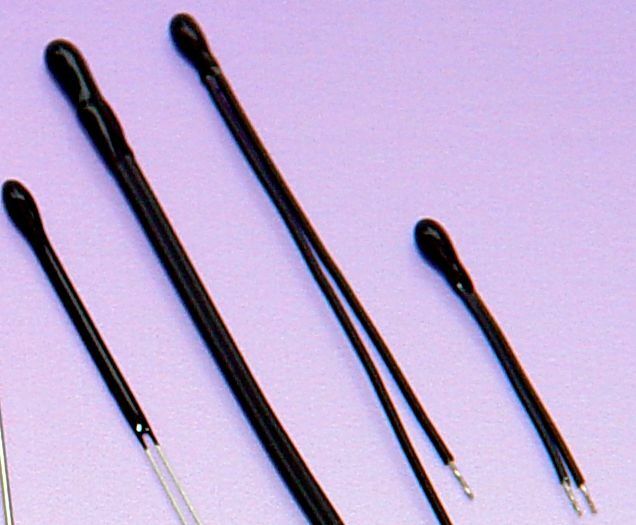 Whilst increasingly used within medical device applications, it is a versatile thermistor which is used within battery packs, mobile devices and surface/air temperature sensors. One of thinnest available worldwide -less than 0.5mm thick. Laminated within 2 polymer layers – flexible yet resilient. Standard R25 values are 10kohms and 100kohms with lengths of 25mm, 50mm, 75mm and 100mm. Stock parts include : 103JT-025, 103JT-050, 104JT-025 and 104JT-050. Originally designed for clinical thermometer applications this small beaded NTC thermistor is very versatile and suitable for wide range of applications. R37 tolerances of ±1% or smaller and matched resistance groups help to minimise unit cost whilst maximising sensor accuracy. Wide range of resistance values, RT curves and accuracies.